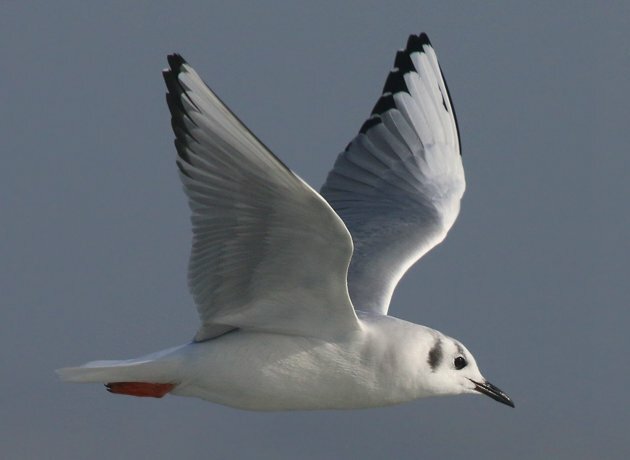 Though I have already shared what birding Shinnecock Inlet, that great, jetty-lined, waterway that connects the Atlantic Ocean to Shinnecock Bay in eastern Long Island, in the snow is like, I thought that perhaps another post was in order. 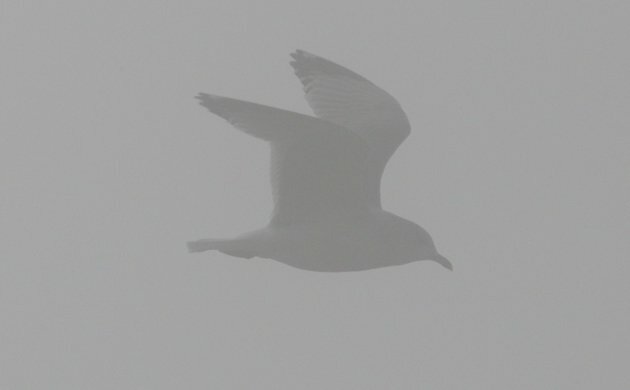 After all, birding in the snow isn’t going to happen very often but fog? That’s relatively common along the coast. And was I ever dismayed to realize how thick the fog still was when I got out of my car on the west side of Shinnecock Inlet several days ago. I decided to stop at Shinnecock Inlet because I wanted to see if I could get some good images of the King Eiders that had been reported there relatively regularly over the last couple of weeks. But with fog blocking the sun and limiting visibility I didn’t have very high hopes of accomplishing that goal. But I walked out onto the jetty anyway because I had already driven out to Shinnecock and what was I going to do, turn around and drive home? 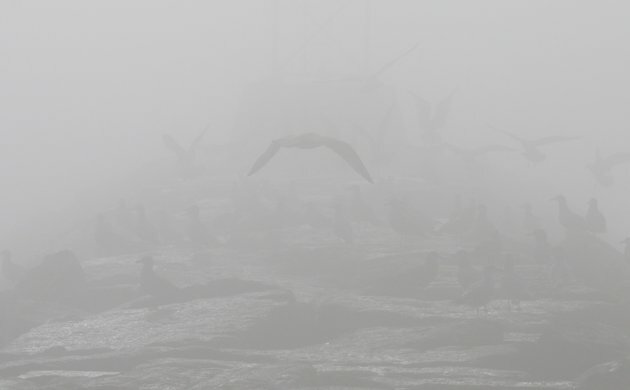 As you can see from the photo up at the top of the post, the walk out to the jetty was, well, foggy. At the end of the jetty, not surprisingly, things were not much better. No matter how I strained to see through the fog everything remained a murky gray. 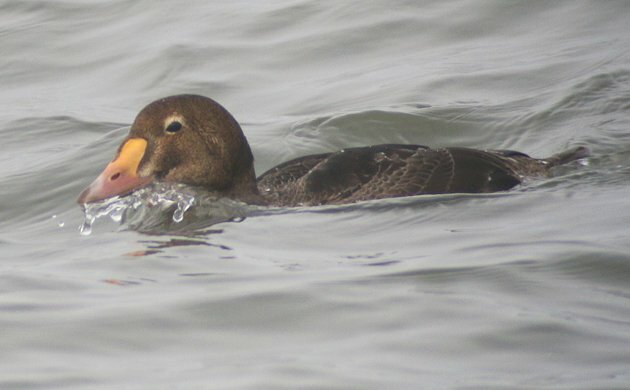 Sure, obvious birds like Surf Scoters were identifiable but there was no way I was going to be able to identify, say, a female King Eider. Now the search was on in earnest and it wasn’t very difficult to find the birds for which I was looking. 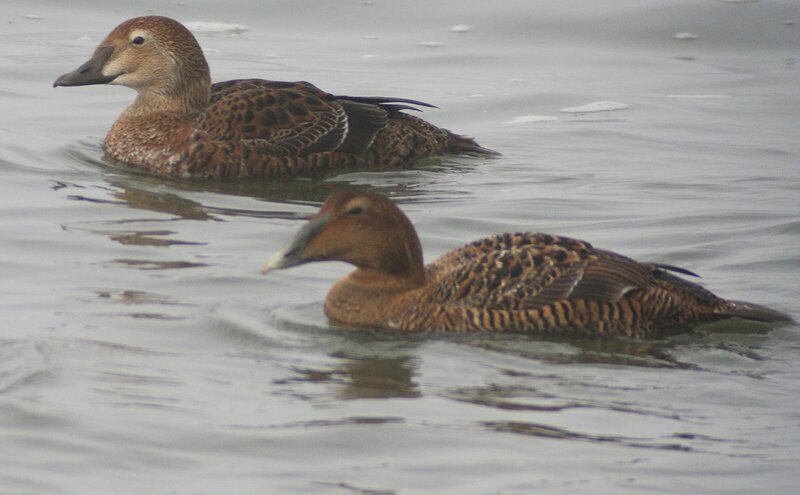 First I spotted a young male King Eider, then the female. I spent about half-an-hour with them before the fog started to thicken again. I wish they had been closer and the sun stronger but you take what you can get, especially with birds as neat as King Eiders! 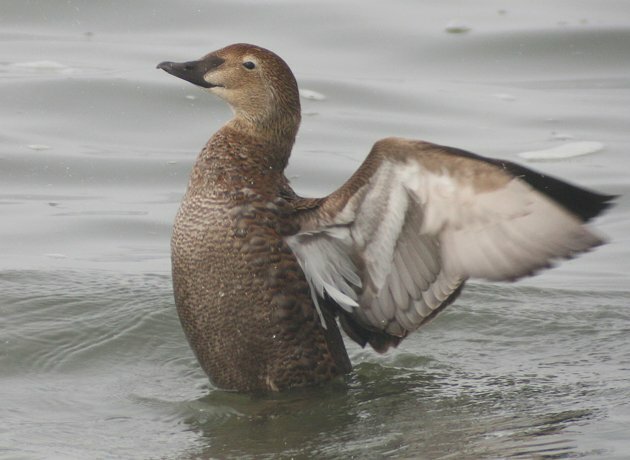 Of course, King Eiders were not the only seaducks present. 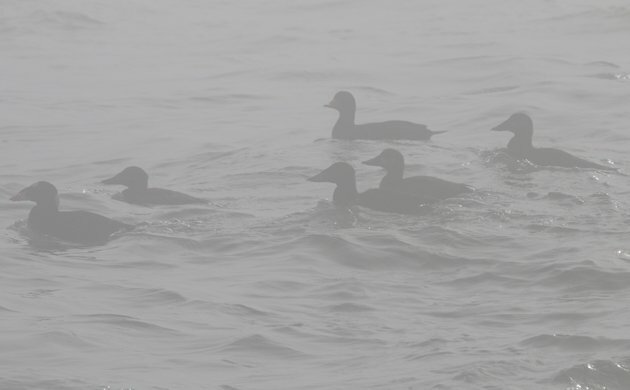 All three scoter species were there, as well as a horde of Common Eiders, Long-tailed Ducks, and a single Lesser Scaup. It was fun to watch each of those species try to protect the fruits of their labor when they surfaced and gulls immediately moved to deprive them of their lunch. 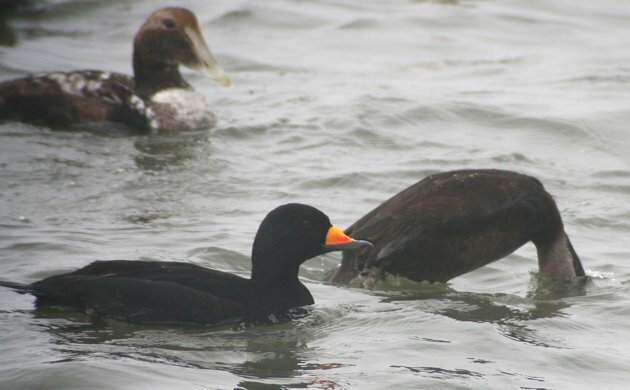 I particularly liked watching the Black Scoters, which I think I have to name as my favorite scoter. 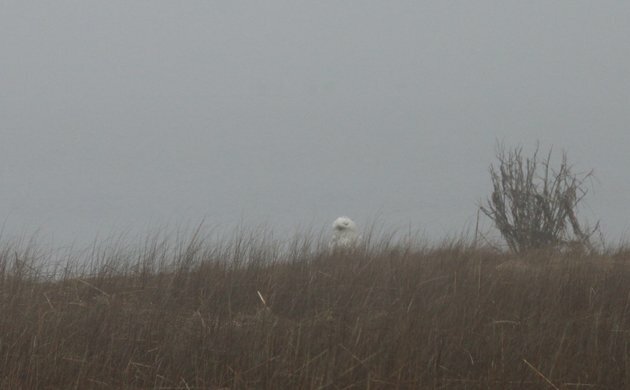 Of course, as is only to be expected in New York this year, once I left the jetty and headed out on Dune Road I couldn’t help but notice a Snowy Owl. You know the birding is good when a Snowy Owl is an afterthought! I’ve really gotten into birding Shinnecock and I can’t wait until my next visit! 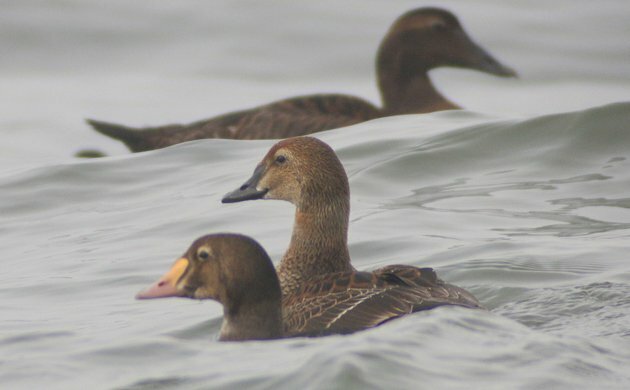 These are the best Eider photos I’ve ever seen!